The first game on Anthony Field at Wildcat Stadium saw a sell-out crowd, football victory and a stunning sunset. The score was final – ACU 24, Houston Baptist University 3 – but the Wildcats weren’t finished. They still had to thank their fans. With arms raised, they ran to the east side of the stadium and returned high-fives from their peers, who leaned over the railing to get closer to the student-athletes. The Wildcats then headed north to greet the children playing on the berm before turning south and continuing the high-fives with fans on the home side. An enthusiastic crowd gathers for the free NEEDTOBREATHE concert. It was more than a victory lap; it was the culmination of years of dreaming, planning and working to create a home for Wildcat football. More importantly, it represented the main goal behind Anthony Field at Wildcat Stadium: to bring the ACU community together. 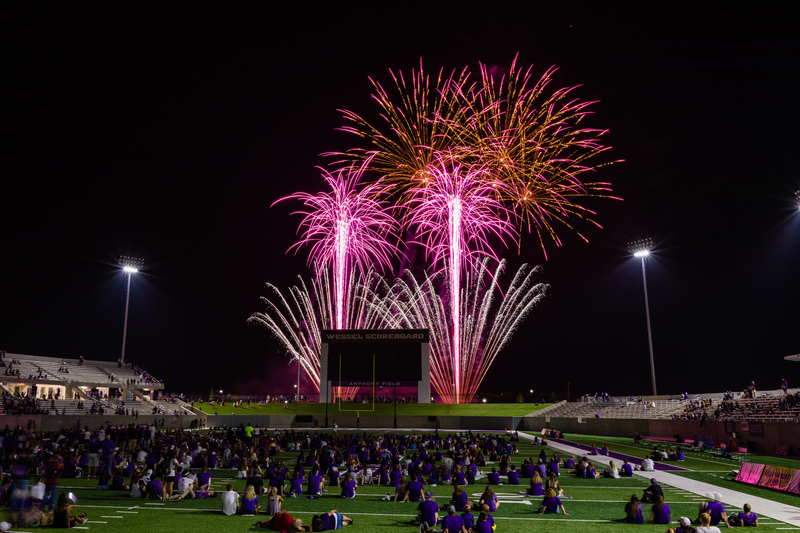 A new era of Gamedays began at Abilene Christian this past weekend with the opening of Wildcat Stadium and the beginning of traditions such as Wildcat Country Tailgating in the Campus Mall. 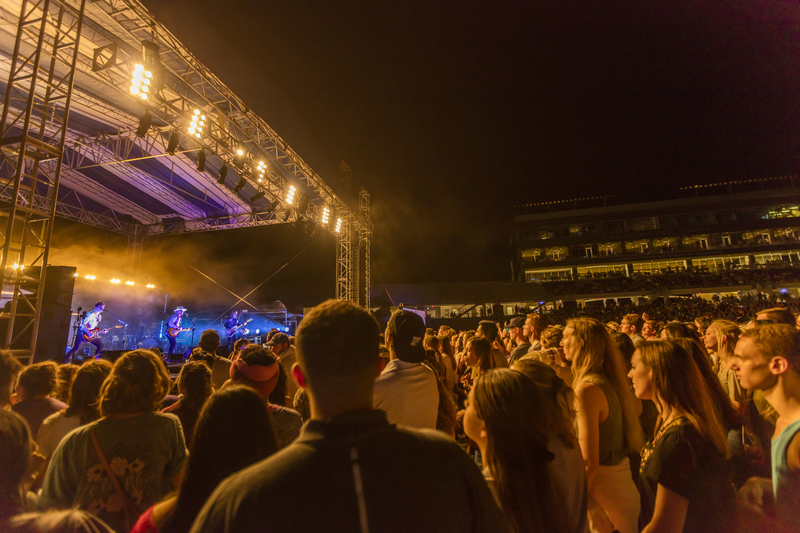 An unprecedented number of students, alumni, friends, parents, faculty and staff – more than Gameday organizers had anticipated – turned out to celebrate Opening Weekend, first with a Chapel session in the stadium on Friday morning, followed by a free concert by rock band NEEDTOBREATHE that night. “I enjoyed seeing students there, laughing and singing along and having fun, and seeing them earlier yesterday on the field and in the stands for Chapel, praising God and creating memories,” ACU president Dr. Phil Schubert (’91) said at a brunch honoring donors to the stadium Saturday morning, including April (Bullock ’89) and Mark (’86) Anthony. Wildcat Country Tailgating officially began at 3 p.m. Saturday; the first fan was in place by 9 a.m. with the rest ready to have fun by about 1 p.m. Tents dotted the Campus Mall and beyond, from Moody Coliseum to Zellner Hall, with everything from social clubs to local churches represented. 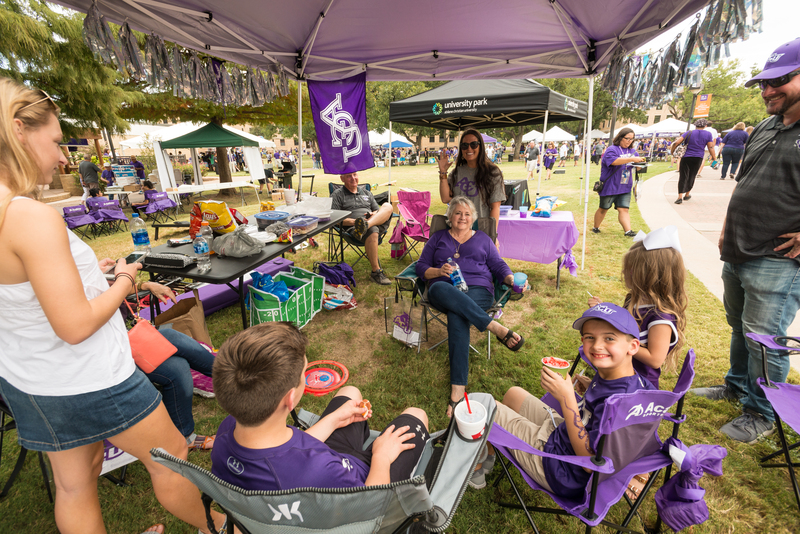 Games, food on grills, dogs in ACU gear, friends and families relaxing – it was a welcome sight for the tired eyes of Gameday organizers including Fisher, Samantha Adkins (’01), talent management specialist for human resources, and Jennifer Ellison (’04), director of university events. Their committee spent more than a year planning for not only the big weekend, but for the new culture around game days at home. The new on-campus football stadium brings with it a new tradition, Wildcat Country Tailgating. Two and a half hours before kickoff, fans lined a path for the Wildcats as they walked to the stadium, and later, the Big Purple Band and ACU cheerleaders performed and led the way to the game for everyone. There, the energy never wavered as fans of all ages enjoyed the new facility and its perks, from gourmet concessions to seeing themselves on the “dance cam” on the Wessel Scoreboard. Senior running back De’Andre Brown, from Lewisville, Texas, scored the first touchdown at Wildcat Stadium. After their win and their time greeting fans, the Wildcats returned to the field to pray as a team alongside head coach Adam Dorrel, De Leon, Schubert and the Anthonys. The night ended with a 12-minute fireworks show that left fans in awe. A brilliant display of fireworks illuminates the stadium as the weekend’s festivities come to a close.